"An epic adventure of phenomenal detail... the Mark of Kri has arrived on the PlayStation 2!" Sony is probably the number one developer of PlayStation 2 games and their hit rate has been extraordinary. With just about every game they make or endorse, its always an amazing game. Mark of Kri is no exception and Sony continues the saga with quality gaming for gamers. Mark of Kri is a combination of a hack and slash game versus beautiful RPG-like storytelling. You play the role of Rau, a warrior who has just reached manhood and has discovered a disturbing secret about his family. Rau has learnt that he carries the Mark of Kri, an ancient curse that has been passed down from generation to generation. Unfortunately for Rau, he learns that six other families also bear the Mark of Kri and that if they are brought together, then the very world could become a very dangerous place. For if all symbols are brought together, they will be linked to form a powerful spell that will allow the underworld to join with the world of the living. Destiny now awaits Rau and hopefully with your help, he will complete his destiny and prevent hell on Earth. My first glance of Mark of Kri was a game that strongly resembled a Disney production with the clean and almost cell-shaded graphics. Then as I progressed through the game, I learnt that this was no Disney adventure for people can live and die in this world. 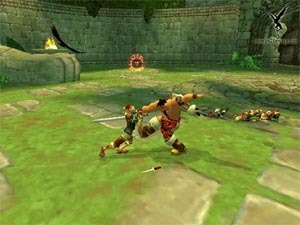 The main method of gameplay in the Mark of a Kri is a combination of stealth and amazing combo attacks. Rau can sneak into enemy encampments, slide along walls or use his trusty raven, Kuzo to spy on the enemy. There is also a variety of different weapons that are available to Rau that include your trusty sword, a bow, spear and an axe. You must then use these weapons in various situations to help you complete your current level. As with all arcade games, the save system is limited and you collect save scrolls around the gaming environment that enable you to save. The beauty of this system is that you can virtually save the game anywhere but the downside is, if you run out of scrolls, you must keep playing until you find another one. The control system of the Mark of Kri is very interesting to say the least. It's the first game of its kind to use a combination of different attack moves. That is, if you see a group of enemies, you must use your analog stick to select all the targets then use your d-pad, X, Triangle, Circle and Square to attack each of the targets individually. Rau can also perform a variety of different special moves such as super attacks with his sword or even snapping the necks of enemies. Whenever you target a singular foe, this is where the game truly shines and stands on its own. 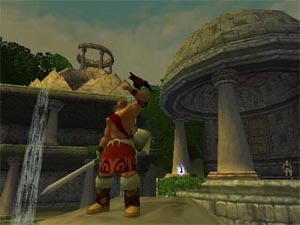 If the target has been given the X button to attack, then you can press a variety of buttons to help pull off combination, for instance, if you push Circle, Triangle and then X to attack, Rau may perform a manoeuvrer where he defeats his opponent then lifts him in the air with his sword. Graphically, the Mark of Kri is a beautiful yet simplistic designed game that strongly borrows from the world of cartoon animation. Everything in the game has this beautiful sharp look to it, whether it's the amazing backdrops or the detailed characters themselves. 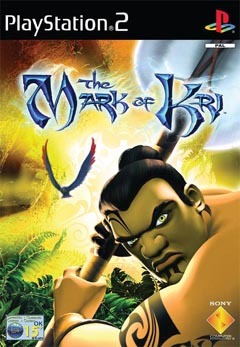 Mark of Kri also pays homage to all good arcade games, Rau and the characters around him contain a fairly small polygon count that help add the cartoon realism of the game. Some of the gaming environments in the game are truly spectacular but unfortunately the majority of levels are fairly sparse and contain a very earthly hue to everything. The world of Kri in every sense is world in its own, as you really get a sense of being part of the game because of the majestic locales and strange yet twisted looking characters. 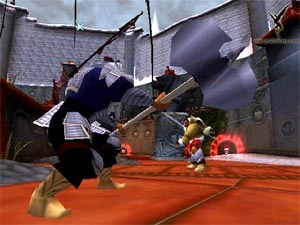 The game also contains a variety of special effects in the game but the most impressive feature of the game is when you control Kuzo, your pet raven. When Rau becomes Kuzo, he can see through the eyes of Kuzo and everything has this very unearthly effect to it as if you were viewing the world through the eyes of a bird. The games storyline is moved along with in game cinemas and still shots from the game that really suit the atmosphere of the Mark of Kri. The sound effects of the Mark of Kri contain a variety of different sounds such as chops, grunts, slices and dices of huge battles with Rau, then to the more sublime sounds of backgrounds such as waterfalls and forests. The voice acting of the Mark of Kri is professionally done and nothing sounds forces or convoluted. Musically, the Mark of Kri sounds like a Hollywood blockbuster with as much fanfare as possible, a beautiful score indeed. The Mark of Kri is a great game that adds some new elements into the world of arcade/RPG's with the new combat system that is truly an innovation. The only downside to the game is that sometimes it does become a little difficult to keep track of switching between all your weapons, especially when you are trying to fight more than one enemy. That said, I'm sure that many gamers will have a great time playing the Mark of Kri with its amazing graphics, great gameplay and a stunning soundtrack! Highly Recommended!